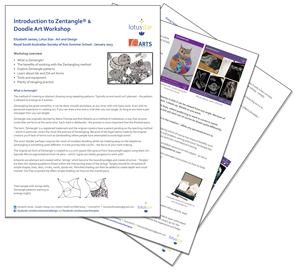 Zentangling is an easy to learn method of creating beautiful abstract drawings using repeating patterns (or Zentangles). 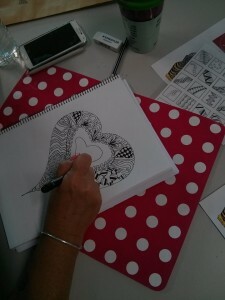 Zentangle is a fascinating new art form that is fun and relaxing. It increases focus and creativity whilst providing artistic satisfaction and an increased sense of personal well-being. Tangling is used as a form of art therapy or active meditation – where the emphasis is on the method and process of creation, rather than working towards a finished piece. 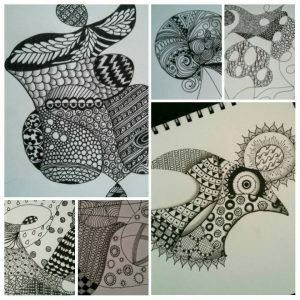 Zentangle art is very relaxing and therapeutic not only to create, but also to admire – the pattern is revealed as the piece evolves – each mark is deliberate. One of the great things about Zentangling is its versatility; it can be done virtually anywhere, at any time, with only basic tools. Even with no perceived experience in creating art, if you can draw a line and a circle then you can tangle. As long as you have a pen and paper then you can tangle! 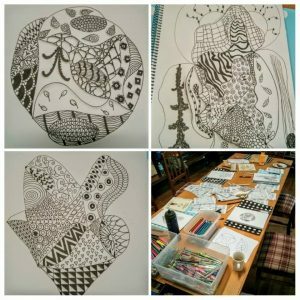 Join us for a fun afternoon learning about Zentangle – a fun yet relaxing art form and method of active meditation and art therapy. No previous drawing experience needed – all are welcome and if you can draw a circle and a line (even a wobbly one!) then you can tangle. A great way to improve focus and experience the therapeutic effects of creating mindful art. Join a friendly group of like-minded people and learn something new. Zentangles are typically completed in black ink – traditionally on a 3.5 inch square tile. We expand upon this during the afternoon to explore the use of colour and shading. 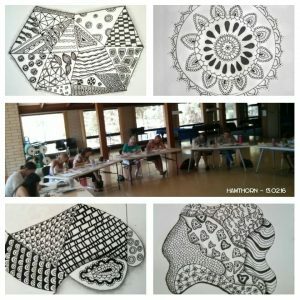 The afternoon further advances as we look at at Zentangle-Inspired-Art – or ZIA – which has a recognisable form. You’ll have the opportunity to try different tools and materials and learn how to add colour and create depth to really bring your artwork alive. The afternoon includes lots of tips and hands on support and guidance from Elizabeth James, local Adelaide Hills Artist, 16-years Graphic Designer and Tutor. All materials are provided including a take home kit worth $20 and reference materials. Numbers are limited for quality of learning. Receive a take home kit bag worth $20 so you can continue tangling! Open to all : If you can draw a circle and line then you can tangle! Suitable for the beginner to more experienced tangler. Exchange : $65 per person. Afternoon tea and all materials are provided, including comprehensive learning materials and a take home kit worth $20. If unable to attend you are welcome to transfer your place to another person. Bank details are available if you prefer a direct transfer. Being mindful simply means being fully conscious and fully present in the NOW moment. Zentangle gifts this and more. 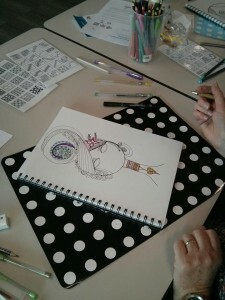 You may also be interested in the Zentangle® / ZIA Create A Canvas Acrylics Workshop – a new and exciting wet media class. I offer flexible delivery to suit YOU! Attend one of the scheduled classes at a local venue to suit (details below). Classes typically run from 1pm till 4pm although the program can be split into evenings. Pricing structure : One-to-one – $180, weekend scheduled group at a local venue – $65, private group at your home – $55 per person HOST ATTENDS FREE (min 5 in the group inc host – price reduction for 8 people+). All materials provided including a take home kit worth $20. Feel free to bring your own equipment if you have and prefer to work with – some prefer to work with an existing pre-loved kit. 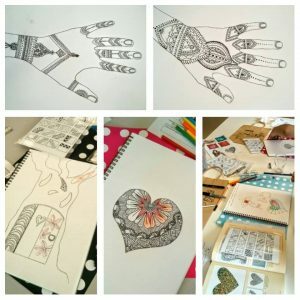 Zentangle Art by Elizabeth James : I choose to combine the artistic style of Zentangles with the awesome form of Mandalas – Sanskrit for ‘circle’ – which are of course also hugely healing in themselves and naturally beautiful to view. Mandalas create sacred space which represent wholeness. I therefore bring you Zendalas – Zentangle designs within a Mandala presentation. 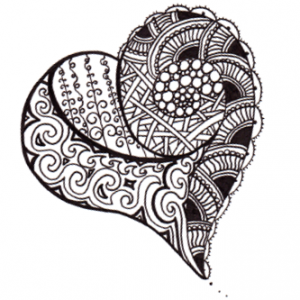 I also produce Zentangle-Inspired-Art and you’ll find examples of each in the gallery.